(The Root) — When the media noted the Aug. 15, 2012, death, at age 107, of Benjamin Isaacs, America's oldest Pullman server, a spotlight was also trained on the Brotherhood of Sleeping Car Porters, the first African-American labor union to win bargaining rights from a major corporation. Isaacs, blind at his death, died of kidney failure at his Victorville, Calif., home. 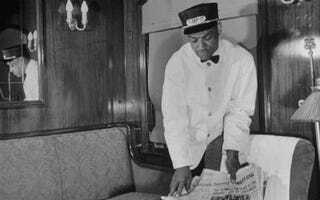 A Pullman porter for 32 years, from 1936 to 1968, Isaacs served thousands of passengers who ate and slept aboard the sleek, overnight trains that crisscrossed the nation before airplanes offered much faster alternatives. The BSCP — the union, established in 1925 by A. Philip Randolph and Ashley Totten, that represented men like Isaacs — was the staircase leading to social and political liberation for its members. At its peak the union, the biggest ever created by African Americans, boasted more than 7,000 members. In 1978 it merged with the Brotherhood of Railway and Airline Clerks. Led by the humble, soft-spoken, indefatigable Randolph, the union was the first black-led labor organization to win official recognition and a charter by the American Federation of Labor. Randolph's triumphant leadership gave blacks a groundbreaking voice at the AFL's negotiation table, where labor's power brokers plotted strategies on pensions and direct action. Before then, blacks were denied access to all labor organizations. Randolph, who had a reputation in New York's Harlem as a principled activist and spellbinding orator, had been approached in 1925 by 10 porters — who lacked any representation — to organize them into a union. Often refused other employment, the men were grossly underpaid, overworked and mistreated. They were often forced to work up to 20 hours without rest. In addition, in 1926 the Pullman Palace Car Co. was paying porters only $810 annually and demanded that they log up to 400 hours a month or 11,000 exhausting miles a year. Despite miserly wages, the porters had to pay for their own meals and uniforms and the polish used to shine passengers' shoes and boots. Randolph faced the daunting task of organizing these men, who lived in far-flung cities across the country. But he was determined, despite the Herculean odds and limited funds — and even as the Pullman company threatened porters with dismissal, hired goons to intimidate them for supporting the union and paid prominent blacks to condemn the organizing. Yet in the end, after a bitter, 10-year struggle, Randolph — with help from other organizers, including Milton Webster in Chicago and C.L. Dellums in Oakland, Calif. — reached the top of labor's mountain. The BSCP signed its agreement with the AFL on Aug. 25, 1935. All previous black-led efforts to create a union for black rail porters and waiters — including the one spearheaded by Isaac Myers, a founder of the Colored National Labor Union in 1869 — had failed. Lyn Hughes — the author of An Anthology of Respect: The Pullman Porters National Historic Registry of African American Railroad Employees and founder of the "75 for the 75th" campaign celebrating the historic achievement — told The Root that "Randolph demonstrated his political genius" in employing tactics that gave African Americans more opportunities to brighten their economic future. Pullman porters, for instance, armed with their collective bargaining agreement, became one of the most prosperous classes in black America. "Many — like E.D. Nixon in Montgomery, Ala., who, with Rosa Parks, organized and planned the famous 1955 bus boycott — were also leaders in their communities," said Hughes, who also founded the A. Philip Randolph Pullman Porter Museum in Chicago. With their salaries, Hughes said, Pullman porters could afford to send their children to college. "If they wanted credit at any store, as soon as they said they were Pullman porters, they got it," she added. Gwen Green, an 87-year-old Los Angeles resident whose grandfather Robert Lee Williams was a Pullman porter, recalled the important place the men held in black society. "They were rich," said Green, a former community-outreach director for Local 6434 of the Service Employees International Union. Although the role of porters and waiters on trains would begin the journey toward obsolescence in the 1950s as Americans' reliance on long-distance rail travel diminished, the legacy of the Pullman porters and their union lives on. Like many of the other porters, Green's grandfather was an activist who became a national instructor for the Pullman company, helping other black men achieve success. Williams' work in the community, she said, served as her own "introduction to political activism." Norman Hill, president emeritus of the A. Philip Randolph Institute, told The Root, "Without [Randolph's] principled leadership, the labor movement would not be the most integrated mass institution in American society." And Randolph's work is still relevant. African Americans "are poised to make more gains in the future," Hill said, pointing to Lee Saunders' June 2012 election as the first black president of the 1.6 million-member American Federation of State, County and Municipal Employees as an example of what can be achieved if blacks focus on organizing. F. Finley McRae is a freelance writer based in Los Angeles.